Lower abdominal pain pain accompanied by light spotting are some of the signs of implantation. But how do they compare to a period or PMS symptoms? The egg implanting itself on the uterine wall is one of the early stages of pregnancy. It is one of the first signs if you get lucky to feel it happening. Most women who are trying to get pregnant or suspecting pregnancy may not know what implantation cramps feel like. Such pain or cramps might get out of hand, you may worry about what to do. It is also important that you gain knowledge on the difference between implantation cramping vs. period pain and other medical conditions that cause such pain such as a UTI. Negative pregnancy test but cramping? Can it feel like a UTI? Slight cramping or pain may be felt around the 8th to 9th day after fertilization. Image source: Wikipedia. It is the attachment of a fertilized egg to the lining of the uterus for growth and development. This process is natural and occurs a week after ovulation has taken place. Spotting or implantation bleeding occurs almost the same time as menstruation. This can make you think you are having a light period when you are actually pregnant. The light spotting is usually one of the first early signs of pregnancy. Other than knowing what implantation feels like, understanding when it occurs can help differentiate it with a scanty period. In most times implantation occurs about nine days after ovulation has taken place. However, in other incidences, it can occur as early as 6 days past ovulation. The sperm entering the fallopian tubes fertilizes an egg within 12 to 24 hours. The fertilized egg, now a zygote, travels down the fallopian tube. During this period the zygote multiplies itself and enters the uterine cavity as a blastocyst. 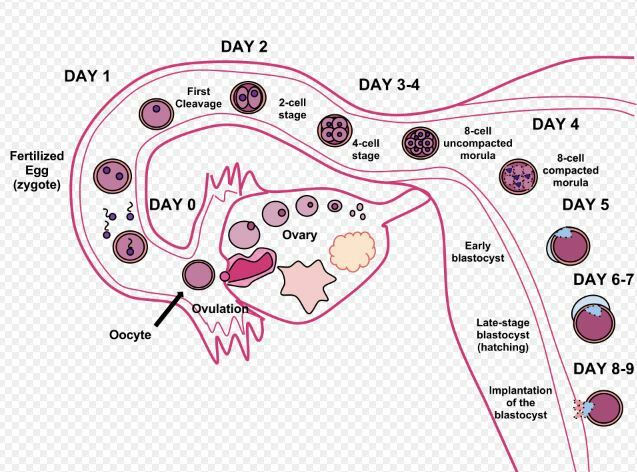 The whole process of fertilization until the fertilized egg attaches itself to the uterine walls takes about 6 to 10 days. Implantation occurs between the 20th day and the 24th day of your menstrual cycle. The embryo attaches itself to the uterine wall during the sixth or seventh day post ovulation (DPO). It is during this time that you will feel cramping and slight abdominal pain. In the first stage (also called adplantation) the embryo attaches itself to the endometrium (Uterine lining). At this stage, the embryo is usually about six or seven days old. In the second stage (also called zygote adhesion), the embryo now penetrates into the uterine wall to secure itself properly in the uterus. In the third stage, the embryo embeds deep inside the uterine wall. During this time the ovum is successfully in the endometrium cavity. The uterine cavity continues to be wrapped as the endometrium grows. Abdominal pain 8 days after fertilization. So, what do implantation cramps feel like? Is it more or less painful compared to a menstrual period? Most women, report pain to be like a pulling or pricking in the lower abdomen. Sometimes the pain is felt on one side of the abdomen, either left or right. Some women have also reported that it feels like a sharp-knife like pain in the cervix. The discomfort can last for five minutes or even two days. It is, however, less severe compared to your period pain. Although this describes how implantation feels like, not all women will experience these symptoms after conception. In some, there may be no pain at all, and the spotting may be very minimal that you may not notice. Most women who experience spotting and cramping always assume they are pregnant, only to get their period a few days later. It can be hard to differentiate if symptoms you are experiencing are as a result of ovulation, embryo embedment or basically menstruation. Occur when an egg is attaching itself to the uterus after successful conception. Occur when there is no fertilization and the uterine wall sheds off because there’s no pregnancy. The pain occur a week after ovulation, Menstrual cramps occur at the end of the menstrual cycle, around the 28th day for a regular cycle. You are likely to experience a hormone rash that is likely to cause fatigue, bloating and even mood swings. Hormonal changes during menstruation can also cause PMS symptoms that may be similar: fatigue, bloating and mood swings. The cramps are quite sharp and sudden. Sharp pulling sensation, especially during a sudden movement. You are likely to experience dull aches that are constant. The cramps cause a tightening sensation around the lower segments of your abdomen, back or both. The pain is constant and does not change with movements, unless in the presence of an underlying cause which might need an immediate doctor’s attention. The pain feels like cramps on one side of the abdomen. Period pains are evenly distributed and of the same intensity both on the abdominal area and the back especially the lower segment. Since it is never easy to distinguish between the two, it is advisable that you monitor yourself for signs of gestation. Some signs such as cravings and nausea might signal successful conception. Here are the signs to watch out for if you actually conceived. Some of these may be similar to period signs, but the differences might be slight. This is the most common sign of early pregnancy. At least one in three women experiences spotting early in their pregnancy. It is a probable sign of pregnancy. Bleeding occurs when the fertilized egg embeds into the uterus wall for attachment. The tiny blood vessels are injured in the course of the process hence spotting. If you notice a discharge before your period, you don’t have to worry, you could be pregnant. But what does implantation spotting look like? Most women report a pinkish or brown scanty discharge that lasts 1-2 days. It is usually light and it is never consistent. Do not expect to see clots during spotting. You might notice that your breasts have changes such as soreness, tenderness, and swelling. Your body produces hormones during ovulation and afterward to ensure sustainability of pregnancy. What you might be experiencing is a result of changes in hormonal levels. The basal body temperature is high during ovulation and even much higher during implantation. The temperature usually rises with an increase in progesterone hormone which is produced in high quantities after conception. You might not notice temperature changes unless you chart your daily temperatures. Charting is important especially if you are trying to conceive. Just like during premenstrual period, the sudden rise and fall of hormones leads to hot flashes. Though hot flashes are not consistent they worth watching for as an early sign of pregnancy. The cervix swells with increased blood flow as a result of rise in progesterone levels. Additionally, the glands are stimulated to produce more cervical mucus. The cervical mucus sometimes contains blood hence the pinkish color. While all the above signs signal successful conception, you cannot be sure until you take a test. Again, remember that not all women present with these symptoms during embryo embedment. Most realize they are pregnant weeks after a missed period. Gestation can only be confirmed by taking a pregnancy test. It is advisable that you wait for at least three days after spotting to have a home pregnancy test. The human Chorionic Gonadotropin hormone is the hormone tested for in urine for pregnancy. It takes several days before this hormone is fully secreted into the urine. The longer you wait, before you can take a pregnancy test, the more accurate the result you are likely to get. Another second way of confirming gestation is by going for a sonogram. A sonogram is medical device that will show an attachment of the embryo to the uterine wall. You can view the fetus in the uterus. However, sonograms use electric waves which can alter the process of implantation. For this reason, it is advisable that you be a little patient. Are you having a number of pregnancy symptoms, but negative pregnancy results? The hormone Human Chorionic Gonadotropin takes time to be secreted fully into urine. This is the hormone produced during pregnancy as a result of chorion (Embryo Yolk sac) formation. It is therefore important that you stay patient for a few more days. Taking the test seven days after a missed period is recommended for accurate results. Does implantation pain feel like a UTI? Some women who might not know they have conceived might think they have a bladder infection. After the embryo embeds onto the uterine wall, the uterus begins to grow, and its blood supply increases. The blood supply system to the uterus puts pressure on the bladder. This causes frequent urination similar to that of a urinary tract infection (UTI). Another sign of UTI is cramping. Cramping occurs as a result of injury to the blood vessels as the egg burrows itself onto the uterine walls. You might occasionally have fevers which might be as a result of elevated progesterone levels. Periodic fevers in the case of UTI are as a result microorganisms in the bloodstream. These alter the normal body metabolism. Since implantation might seem like a UTI, you need to visit your doctor for further tests and investigations to rule out a urinary tract infection. Here are other common symptoms of UTI during early pregnancy that might need you to visit your doctor immediately. Back pain, in case the bacterium spreads to the kidneys. Cramps are not only annoying but also distressful. Finding remedies that work at that time of the month can be a big relief for any woman. Here are top five tips that will help you get rid of cramps fast. If you are having a hard time relaxing, consider taking a warm bath. A warm bath helps relieve cramps by relaxing the ligaments and the muscles of the uterus. Alternatively, you can compress a warm cloth on your abdomen to help relax the muscles. Medications such as Ibuprofen can help alleviate pain. Follow the dosage and instructions on the bottle to avoid temptations of overdosing which might be fatal. Sleep will give your body time to relax and recover. It will also give you a break from the pain and discomfort. Most women report less pain after waking up. Minerals like calcium profoundly reduce the intensity of period cramps by causing involuntary muscle relaxation. Calcium also deals with depression, fatigue, and loss of appetite. Magnesium is another potent muscle relaxer. It also prevents you from cravings which may lead to bloating during early pregnancy. Most vitamins work by blocking prostaglandins which are responsible for inflammation and pain, therefore relieving you from cramps. To get the maximum benefits from vitamins, you have to start consuming them early before your period. Studies show that caffeine worsens cramps. Caffeine in high quantities can cause dehydration. It is bad to drink a lot of coffee during pregnancy. Besides, foods containing caffeine exacerbate symptoms such as depression, anxiety, and fatigue. You are advised to take lots of herbal tea and water to help you stay hydrated. Moving around more helps you get rid of cramps fast. Exercise prepares the body for period and also releases endorphins. Endorphins are special chemicals that have an ability to help you feel better as long as you stay active. Exercise also helps divert your mind away from the pain and agony of the cramps. Bananas contain high levels of potassium. Cramps sometimes are as a result of low potassium levels. Consuming foods rich in potassium will help you get rid of cramps fast because potassium is a potent muscle relaxer. Bananas also contain vitamin K which helps balance your menstrual flow. For most women, implantation occurs without them realizing it. For those experiencing cramps, it lasts for about three days. When cramps get severe or extreme, interfering with your daily activities. When you experience tenderness in the lower abdomen. When you have developed symptoms of an infection such as fever and body aches.